Tarah: What is your background? Michele: I am a stay at home mother of three boys ages 8, 10 and almost 12. I went to school for early childhood education and worked to create the preschool program for the local YMCA where we lived. Once I was married and had my first son Mason I knew I wanted to stay at home with him. Two years later came our second son Riley and 2 years after that our youngest son Camden. I love all that goes into being a stay at home mom. 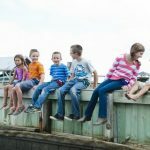 Tarah: How did you become involved in the food allergy community? Michelle: My first exposure in the food allergy world was when my aunt’s son was diagnosed years later. When Camden was 2 years old he was given peanut butter and had an anaphylactic reaction. From that moment on, our lives were different. We learned to navigate the landmines in the grocery store and educated everyone who cared for Camden. About 2 years ago, Camden was tested again and his peanut allergy levels were off the charts, literally! We were advised to remain vigilant over him not being exposed. Then last November; Camden had an anaphylactic reaction while at a church function. We were very lucky to be able to inject him and get medical care in time. This reaction shook Camden’s confidence. My once carefree boy was now afraid to leave my side and was afraid to go out and play. I wanted to protect him. I learned all I could about being prepared and doing everything in my power to keep my son safe. Most importantly, we had to find a way for Camden to comfortably and securely carry his epinephrine with him on the go. 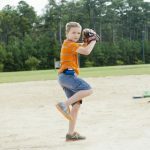 We tried several medical bags, packs and pouches on the market, but none could live up to my son’s active lifestyle. Most bags were either too bulky or of poor quality. We had to find a better solution and thus the WOOB was born. Tarah: Can you tell us about your products? Are they available online? For retailers? Do you ship outside of the US? Michlle: The WOOB is our creation for carrying epinephrine on the go. The WOOB was the perfect solution to my son’s needs. 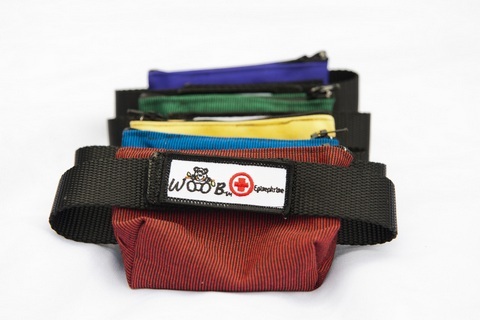 All WOOB bags are designed to carry two injectors, including EpiPen or AuviQ brand injectors. It gives children the ability to safely and securely carry their medication with them wherever they go. At first glance, the WOOB may seem similar to other bags out there, but there are two main differences: Security and Durability. The WOOB is created using only quality materials and craftsmanship. 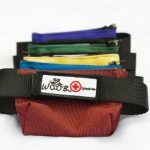 The WOOB is designed to securely attach to your son’s or daughter’s clothing using only two of their belt loops. The WOOB straps are secure. They run through the 2 loops and wrap around once to fasten the straps together with a high strength velcro. Once attached, the WOOB becomes an integral part of your child’s clothing and need not be removed for the rest of the day. This secure attachment allows your child to move freely while knowing they are safe, should a reaction happen. Unlike other medical bags that go around the waist, the WOOB will not ride up onto your child’s skin, slide off or become a hindrance. Don’t have belt loops on your pants, don’t worry. With our WOOB LOOPs any bottoms can be WOOB friendly. These loops are attached by simply sewing on 4 buttons.his waist (fanny pack style), which he did not like because it would rub on skin when it rode up over his jeans or it went in all the belt loops (with or without the need for a belt) which required undoing when using the bathroom. The other common style seemed to be a climbing hook which attached to one belt loop. This bag seemed to move quite a bit. Having said all that the biggest difference is that our bag carries 2 injections no matter which of the 3 styles your choose with room for a single dose of an antihistamine. In addition a donation is being made to allergy research for every bag sold. Last, we have our WOOB LOOPS which creates belt loops for pants/skirt/short without belt loops meaning you have no restrictions with what you can wear to use the bag. We are currently working on an attachment to make it friendly for dresses. Our company is also in the process of making a bag to include a child’s inhaler as well as their injections and a teen bag which could carry injections and a phone The WOOB is versatile because it can be secured to most anything. For example, if your child is swimming, the WOOB bag can easily be secured to a purse or chair allowing easy access. WOOB is currently available at our Etsy Shop, WOOBbagsaves. Please visit our website woobbagsaves.com for further information. We currently ship inside of the US and will soon be expanding worldwide. A donation will be made to allergy research for every bag sold. Tarah: How are your bags most commonly used? Michelle: WOOB bags are used to provide children with food/bee allergies the ability to have their life saving epinephrine injectors with them all the time. A child with food allergies designed this bag. He knows first hand, what works and what makes him feel safe. They are clearly labeled and easy to use. Tarah: Tell us about the biggest impact you have had with your bags. Michelle: After Camden’s reaction last year, he had lost confidence and that carefree feeling a child should have. While the WOOB is not a miracle, it has given back something that was taken from him. I have heard from many moms about how their child was able to regain their independence after getting their WOOB. These children can now live safe and secure knowing their injectors go where they go. Camden wants all kids to feel safe and comfortable playing just like he does. Tarah: What do you like to do for fun? 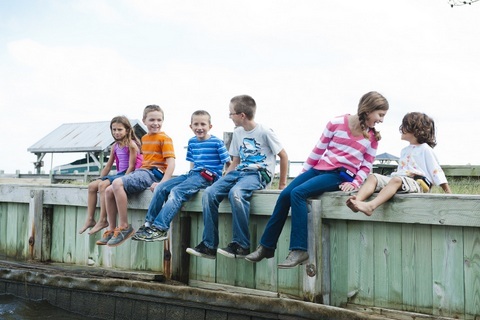 Michelle: For fun I like to volunteer with the local outreach programs in the Outer Banks of North Carolina. Our favorite is helping care for sea turtles with N.E.S.T., The Network for Endangered Sea Turtles. I also love to bake for my family and friends. So what do think? Do you want one? Sim ply leave a comment or like Allergic Traveler’s facebook page. Good luck! I would LOVE one for my little guy. We’ve always kept Epi-pens in the diaper bag, but now that he’s potty training, we need a new solution.